What key developments will shape natural gas demand in 2019? Coal and renewables provide stiff competition and are among the factors to watch. The last two years saw faster growth in global gas and LNG, but this might not continue: there are signs that global economic growth, including China’s, is slowing down. 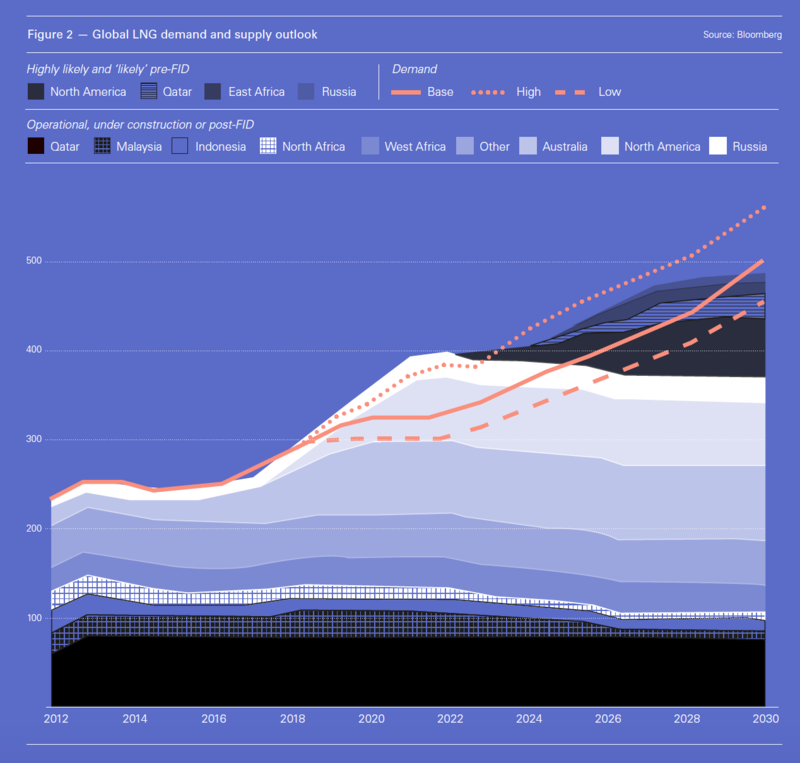 Coal is holding its own and in demand is still increasing in China and India. Renewables continue to become cheaper, increasing their share of global power generation. The single most important factor to impact global oil and gas markets in 2019 will be the slowdown in the Chinese economic growth and in manufacturing activity. Economists expect China's growth to fall to 6.2% in 2019, in comparison to 6.6% in 2018 and 6.9% in 2017 – still strong in absolute terms but the weakest since 1990 – which will also affect economies across Asia. This is part of a deep and longer-term transition that started last year, but it is also exacerbated by China’s trade dispute with the US, its own runaway debt and a slow-down of exports. With China now being the dominant energy market globally, this will impact oil and gas markets and prices. Apple’s warning early in 2019 of lower revenues from China is not an isolated incident and the effects are being felt more widely. The oil market volatility experienced in 2018 is rolling over into 2019. Over-production and a lower increase in global demand are having their impact despite Opec+Russia’s planned oil production cuts. This is driven in part by China’s slowing economic growth, but also by concerns about the global economy, with global GDP growth expected to slow down to 3.6% in 2019 in comparison to 3.8% in 2018. If this turns out to be deeper or the US-China trade dispute lingers or escalates the impact on China’s energy imports and on global oil and gas markets will be stronger. Opec has been forced to scale down its demand increase forecast for 2019 to 1.29mn barrels/d from 1.36mn last September, posing concerns about the robustness of global oil demand in 2019. However, Opec+Russia are expected to achieve their announced production cuts of 1.2mn b/d early in 2019 and the escalating crisis in Venezuela and the sanctions on Iran are likely to contribute to a further reduction. On the other hand, non-Opec and US crude oil production and exports will carry on rising in 2019 – by as much as 2.16mn b/d according to Opec, counteracting these cuts. Added to this is the US president, Donald Trump, who has been exerting pressure on Saudi Arabia to produce more oil to offset the impact of his sanctions on Iran. This is what contributed to the downward pressure on oil prices at the end of 2018, continuing into 2019 despite a small recovery. Nevertheless, most oil analysts project that in 2019 the benchmark dated Brent contract will average $60/b-$70/b; and its US counterpart West Texas Intermediate will be between $50 and $60/b. This is based on the expectation that the global oil supply and demand will balance. If Opec is right however and supply does exceed demand, a possibility given US shale oil resilience, or if Opec cuts are not followed or not extended beyond the agreed six-month period, then prices will trend lower, with Brent possibly back in a $55/b-$60/b range. The relentless increase in US shale oil production might also cap the oil price in 2019. Initial indications are that the Opec+ oil production cuts – with Saudi Arabia making an early start in December – are already helping prices rise. But, given the above doubts and concerns, the question is: will this be sustainable? With the close link that exists between LNG and oil prices, this, and record LNG supplies expected in 2019, are bound to keep LNG prices low in 2019. According to Platts, during last year’s December to February winter period, the spot LNG assessment for northeast Asia – the Japan-Korea Marker (JKM) – averaged $10.35/mn Btu. So far this year, prices for deliveries in February have been under $9/mn Btu. In addition, JKM swaps markets are now pricing 2Q 2019 cargoes not much above $8/mn Btu, and 3Q 2019 cargoes below $8/mn Btu. Spot prices at the Dutch Title Transfer Facilty for February deliveries are just over $8/mn Btu and down to $7.36/mn Btu for the summer. Sluggish economic growth and a mild winter could limit gas demand growth in Europe further. Evidently gas and LNG prices are trending lower this year than last to 2018. The outlook for gas demand in 2019 in China, but also in Japan, South Korea and India, is one of the most important questions facing the global gas market, as it will have significant consequences for gas producers and consumers across the world. Sanctions and the trade war between the US and China are posing increasing threats to the global LNG trade. In fact these have brought home to China its vulnerability to import dependency and threats to its energy supplies from third parties. On top of this, China is going through an economic slowdown, expected to be long-lasting. A result of the economic slowdown is that it is becoming increasingly apparent that China’s ambition to improve air quality is difficult to reconcile with its need to sustain jobs and economic growth. This now appears to take priority over clean air policies, impacting coal-to-gas switching. Under these threats, for economic reasons and concerns about import dependency and energy security, China changed its policies making them less demanding in its new 3-year action plan for air pollution released last July, in effect making it possible for regional governments to increase clean coal production and consumption. Along with a rapid increase in renewables – in fact renewables are posing an increasing threat to gas – and nuclear capacity, China is countering these threats by boosting indigenous resources. In doing so, China has relaxed its clean air policies that led to the massive increase in LNG demand late in 2017 and most of 2018. As a result, even though at the start of the year it was expected that China’s coal production would decline by close to 1%, it was actually in line to increase by more than 3% in 2018. And there are indications that a large number of new coal-fired plants are still being built in China. These developments, combined with the fact that domestic gas sales based on expensive imported LNG are loss-making, will be impacting China’s LNG import growth, expected to slow down in 2019 to less than half the 44% rate of growth in 2018. This is still quite significant, but not sufficient to absorb the looming increase in global LNG production. 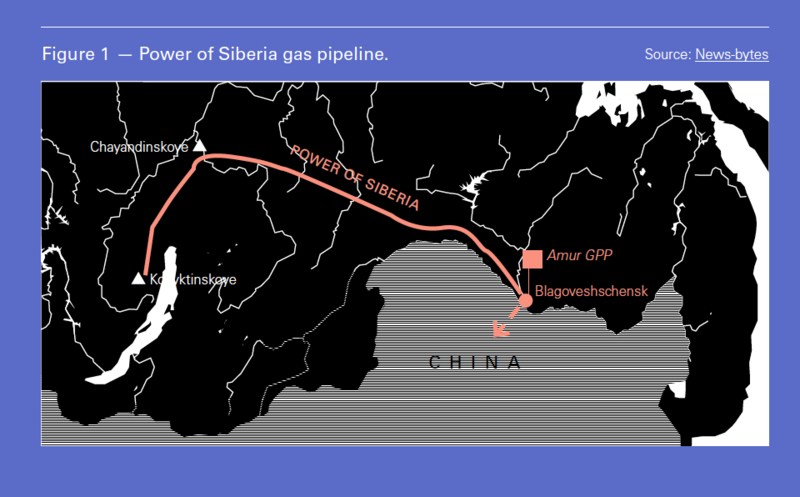 In addition, the Power of Siberia pipeline (Figure 1), with its capacity of 38bn m3/yr, is over 90% complete and is expected to start delivering gas to China end of 2019, taking up a significant part of China’s future gas demand, impacting LNG imports. Domestic production is also expected to increase by over 8% in 2019. Early winter season procurement efforts have pushed storage levels to comfortable levels in China. This has led to deferment of deliveries and reselling of cargoes. However, these may also be indications that a longer-term trend could already be at work. Japan released in July 2018 its new energy plan to 2030, going back to nuclear at the expense of gas, all of which is imported. It aims to cut a quarter off its LNG, from 84mn mt in 2017 to 62mn mt in 2030. This process has already begun, with five nuclear reactors restarted in 2018 and another six that may restart in 2019. December LNG imports were 12% lower than in November, partly as a result of warmer weather. But further cuts in LNG demand are expected in 2019 as nuclear reactors restart. South Korea is doing something similar, by restarting nuclear power production. Even though gas consumption is expected to carry on increasing, it is expected to be at a low rate of the order of 1%/year. India talks about more gas in future, but its pipeline infrastructure cannot handle increasing LNG imports beyond the existing import terminal capacity of 30mn mt/yr. Building pipelines is a very challenging process that can take years, owing to complex right-of-way issues. It is also not giving up coal – quite the contrary. Coal demand rose 4% in 2017 and is carrying on at a similar rates. The priority in India is a rapid increase in cheap renewables, with a target to increase capacity to 175 GW by 2022. Even if it manages only three quarters of this it will still be a huge achievement. These developments, combined with milder weather, will be having an impact on slowing down growth of LNG demand in Asia in 2019. LNG exporters could face headwinds in 2019 as potentially weaker demand from Asia meets the impending expansion in global liquefaction capacity (Figure 2), keeping the export market under pressure. This will be especially so if the growth in demand follows the ‘base-case’ in Figure 2, which looks likely. UK’s National Grid actually expects lower demand for natural gas in the UK in 2019, with coal replacing some gas on price, in addition to the impact of increased renewable generation. With Gazprom committed to maintaining, and possibly increasing, its gas exports to Europe in 2019, gas prices are set to fall in comparison to 2018, as indicated above and possibly nearer the $7/mn Btu mark. But higher carbon prices may impact coal consumption and bolster gas demand in power generation. However, weaker demand in Asia and increased production is forcing more LNG to be diverted to Europe. Even though it may not make major inroads, LNG sales will increase in comparison to 2018, putting pressure on European gas prices. According to the US Energy Information Administration (EIA) US crude oil production will surge above 12mn b/d in 2019, as a result of the continuing growth in shale oil production and the easing of pipeline constraints in the Permian Basin. But given that US oil production ended 2018 at 11.6mn b/d, the likelihood of exceeding 12mn b/d in 2019 can be considered to be quite high, and acting as a brake on oil prices. However, shale oil may be a victim of its own success, with weaker oil prices potentially posing a challenge. Together with shale oil come large quantities of cheap associated gas. The EIA estimates US proven natural gas reserves now exceed a record 13 trillion m³. The EIA in its Annual Energy Outlook 2018 predicts that future US gas production will grow at almost twice the rate of US demand growth, leaving a large amount available for export. Total US natural gas production is likely to exceed 900bn m3 in 2019. The US became a net gas exporter in 2017, and exceeded the 50bn m³/yr LNG export milestone at the end of 2018. LNG export capacity is expected to increase to about 100bn m³/yr as three new terminals come on line this year. And there are more liquefaction projects in the pipeline awaiting approval in 2019. In 2018 close to 60% of US exported LNG went to Asian markets. But given the trade war with China and expected weaker increase in demand in Asia, increasing US LNG exports may face challenges securing markets in 2019. The outcome of the UN COP 24 conference in Poland in December was disappointing, despite the growing evidence that global warming is having a serious impact on world climate. 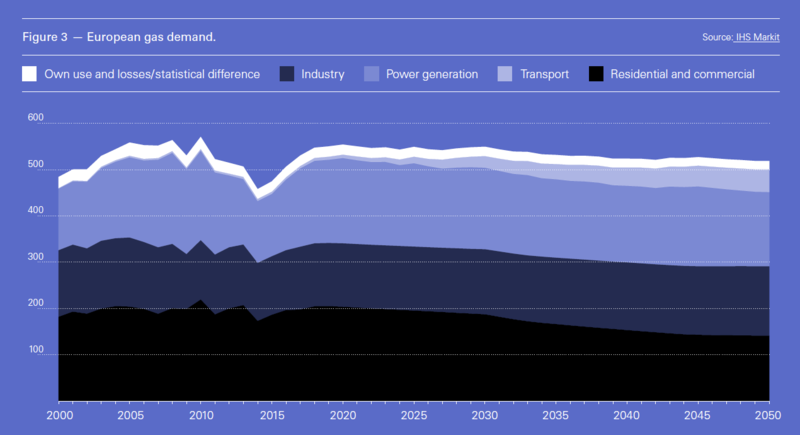 But this probably reflects the view that renewables are not yet up to the mark to replace fossil fuels at large scale: they are now only making inroads into power generation. Renewables are growing, but not fast enough to keep in pace with global energy demand growth and so inhibit the growth of cheap gas. Forecasts show that based on current policies renewables may provide over 40% of global electricity by 2040 from 25% today. But when it comes to total primary energy demand the corresponding numbers are 17% and 10%. The rest will be provided by fossil fuels. But activists and climate campaigners may take matters in their own hands, with legal challenges and pressure to divest from fossil fuel companies increasing in 2019. 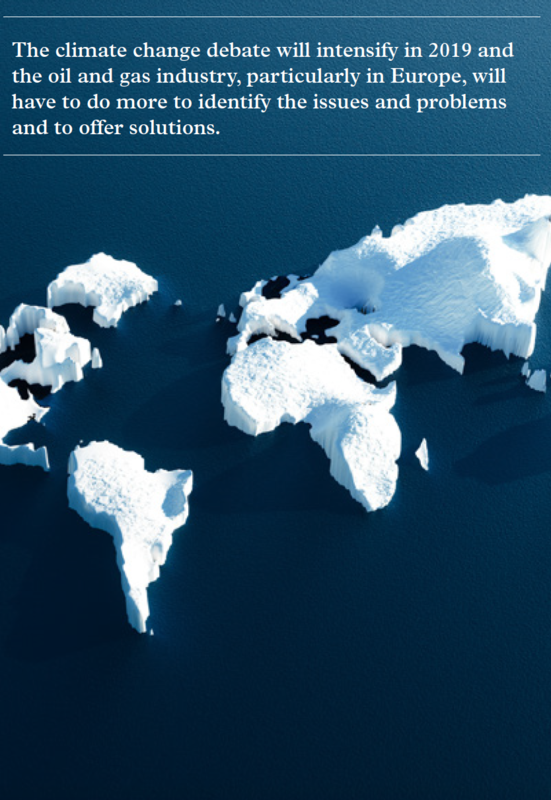 The climate change debate will intensify in 2019 and the oil and gas industry, particularly in Europe, will have to do more to identify the issues and problems and to offer solutions. In an ‘age of plenty’, competition to secure energy markets is becoming fiercer. Natural gas is up against cheap coal and renewables. Securing gas markets requires competing against both on price. The International Energy Agency (IEA) published its annual coal report in December, Coal 2018, and it confirms that coal production went up in 2018, likely by 2.5%, following the 1% increase in 2017. This is driven by increased consumption in China and India, which is likely to continue in 2019. Coal is still providing 40% of global electricity generation. The relentless increase in renewable power generation will continue at a rapid pace in 2019, driven by developing economies taking advantage of the plunging cost of renewable energy. Energy storage will be a hot topic in 2019, with costs driven downwards making it more competitive. The global energy markets are price-sensitive. This was confirmed in the UK during the last quarter on 2018. Gas prices higher than coal prices, even allowing for carbon pricing, led to the resurgence of coal imports and this is expected to continue into 2019 according to National Grid. It was by a rude awakening – clearly cheaper still beats cleaner, even in the UK: the first EU member to introduce a floor price for carbon that was intended to be high enough to choke off demand for coal in the power sector. All in all 2019 will be as volatile as 2018, probably more so. But as long as natural gas remains cheap, as it is expected to be in 2019, it will hold its own.